A stunning home designed by Chip and Jo just hit the market to the tune of $1.15 million. If we have one complaint about Fixer Upper, it’s that it can be a little painful to sit by and watch other people live out their home dreams while we secretly wait for our five seconds of HGTV fame. Well, our days of dreaming might just be over (sort of): While a number of Chip and Jo-designed homes have hit the market before (most recently, the Dutch Door House), one special gem has just come up for sale—and, according to House Beautiful, it can be yours for a cool $1.15 million. Journey back with us, if you will, to season 2, episode 12—the Faceless Bunker House. Even if you have yet to binge-watch every season of Fixer Upper (although let’s just assume you have), you’ll probably recognize this home. In search of their own slice of tropical paradise, the Gaines were tasked with finding a modern beach home for longtime island-dwellers, the Fuchses. 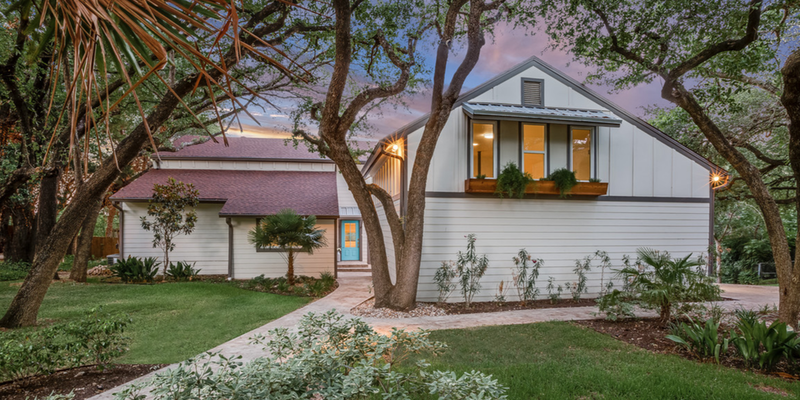 And although beach-style homes are far and few between in Waco, Texas, the duo saw potential in one abode. In true Chip and Jo fashion, the pair transformed the once-dated, four-bedroom home into the ultimate family-friendly retreat. Dreamy backyard views and killer kitchen aside, Chip and Jo’s magic touch alone is enough to justify the home’s surprisingly steep asking price. Up for a walk down memory lane? Peek inside the incredible fixer upper ahead. Lacking in color, light, and personality (check out all the before images here), the Gaineses made major changes to the exterior of the home—for example, adding all new landscaping for tropical ambiance, replacing the brick siding, installing a faux balcony, and adding windows to the front of the home. Today, the house truly makes the most of the 1.9 acres of land it sits on. The Faceless Bunker House is perhaps most well-known for its quirky entryway and layout. After the duo replaced the heavy wood railings and posts that originally stood in the entry with a sleeker steel and cable railing, Chip and Jo’s slimmer upgrade completely opened up the heart of the home, making it especially easy to sneak in unobstructed views of the backyard. The fully upgraded kitchen and open concept dining area are also located on this same level. Now appropriately decked out with plenty of storage, floating shelves, colorful tile backsplash, and a separate butler’s pantry, it’s safe to say that this super chic cookhouse is one of our all time favorite spaces featured on the show. Large French doors off the dining room introduce an abundance of natural light and easy access to the outside patio. Downstairs, a simple fireplace—which Chip and Jo refaced in black tile for a fresh, contemporary look—serves as the focal point of the main living space. An enormous blank wall—where a custom piece designed by a friend of Joanna’s now hangs—is the perfect spot for the home’s next owners to showcase equally telling artwork. The master bathroom also got a serious facelift. Per the couple’s desire for a more “beachy” retreat, the space now boasts a spa-like soaking tub, a set of double Alder wood vanities, and a glass-enclosed shower. However, that’s not to say that Joanna’s classic farmhouse touch hasn’t left its mark. Back downstairs in the bar and game room, exposed brick, mixed metals, and reclaimed wood steal the show. Robert Barben and Cate Marmonti of Solid In a Snap and Bridge Realty currently represent the listing.